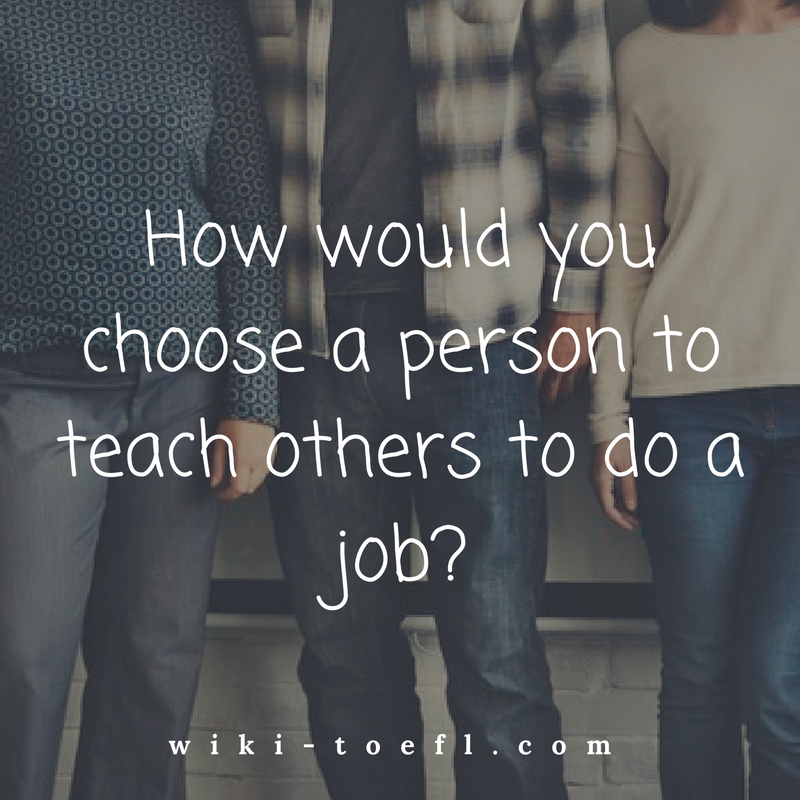 Home Writing	Toefl writing: How would you select a person to teach others to do a job? You must select a person to teach others to do a job. Which one of the following is the most important for you to consider in making you selection? Training someone to do a job is an important task. It requires a good education, work experience, and skilled job performance. Of these three requirements, I believe it is most important that a potential job trainer be judged on the quality of his or her previous work. A person may be well educated, but not able to perform a job proficiently. A doctor may know how to treat childhood diseases, but not be able to train medical students to perform surgery. An accountant may be able to balance a company’s accounts, but not be able to help the company’s executives invest their money. A person may have a lot of work experience, but not be able to do the job well. Time is not the best measure of quality. A mother may spend 17-years raising her children, but not be able to train young mothers to care for their infants. A typist may have typed ten-years worth of letters, but may not type over 30 words a minute. A person who does a job well is the one you want to be a trainer. I want to learn to fly a plane from a pilot who has faced a lot of mechanical problems in flight and never had an accident. I want to learn how to make money from a billionaire not form a salaried investment broker. As in all things, it is quality that we look for, not general knowledge or time spent in an occupation. I want others to learn from the best, so they can be the best, too.